Communication among cells is the basis of all immune and nervous system activity. Research continues to find large vocabularies of signals in different languages—neurotransmitters, cytokines, small RNAs, protein transcription factors, small lipid molecules and glycan sugars. The numbers of signals is growing fantastically with at least 50 neurotransmitters, 100 cytokines, thousands of transcription factors and small RNAs and as yet indefinable large number of ubiquitin tags, small lipids and sugars. Now a new large class of signals has been found to be crucial in immune signaling—small peptides. Vital immune communication with peptides uses at least 3000 versions. The new little known vital language of cellular communication in immunology consists of small peptides called host defense peptides (HDPs). These are short molecules with unique properties that can interact with both water solution and fatty environments. These properties make them ideal in membranes. Usually one end of the molecule likes water and another end doesn’t. Many different cells and tissues produce them. Signaling peptides are negatively charged and are attracted to positive charge in other molecules. These signals have many different functions, including avoiding autoimmune reactions. They are signals that modify microbe behavior and help in controlling inflammation and healing wounds. It is another class of important signals in very elaborate cell signaling. HDPs were first known as antibiotics produced in plants, insects and most other animals. There are more than 2500 different peptides produced in cells that have some effect in controlling microbes. Recently, these peptides are found to be critical signals in humans for elaborate communication about defense against microbes. These peptides are now not thought of as antibiotics but rather signals that alter the behavior of immune cells. Not surprisingly, like other signals, their effects are very complex and don’t reflect a small number of receptors and pathways. Rather, HDPs interact in multiple pathways in complex ways and produce antagonistic results. HDPs help maintain the complex relationships of microbes in the intestine. Problems with these can cause bowel disease with inflammation, such as Crohn disease. Many microbes produce a lipid enzyme that alters negative charge on the surface decreasing their antibiotic effects. Low amounts in the nose and ear can cause otitis media. Databases that catalogue interactions between proteins are being used to try to find out how to use these peptides. InnateDB database lists 365,000 such interactions. The first HDP was found in a moth in 1980. Since this moth didn’t have an advanced immune system, they were thought to be antimicrobials. But, when many others were later found in animals with advanced immune systems, their complex roles began to be discovered. Previous posts demonstrated that epithelial lining cells in the intestine and skin are involved in extremely complex signaling for many different purposes. These lining cells produce many of the HDPs. Large concentrations of HDPs have been found in granules of specific blood cells (leukocytes) and in intestinal crypts. 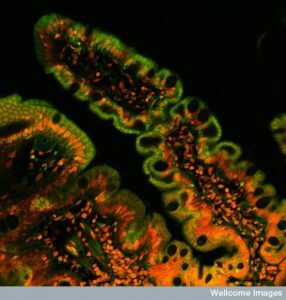 Large amounts of HDPs in intestinal crypts creates a specific environment, but not at the mucosa layer. Most HDPs are not used in high concentrations to form a microenvironment, but are used in small concentrations as particular signals. 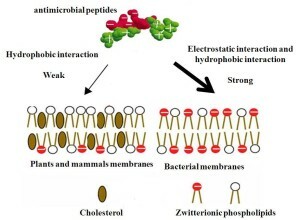 In fact, normal physiological molecules such as salts, proteins and lipoproteins usually suppress HDPs antimicrobial activity. Their primary activity is as signals. There are a large number of families of HDPs. Most research has focused two distinct families of peptides called defensins and cathelicidins. 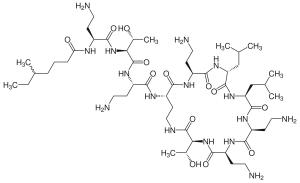 One of the first examples of HDP ‘s complexity is found in a class of peptides called cathelicidin. It is also known as LL-37. 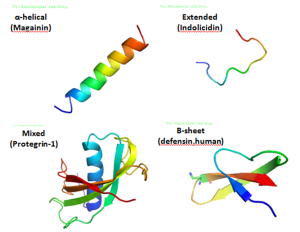 Cathelicidins are a large class of active peptides ranging from 12 amino acids to 80. These have many varied structures. Most fold into α-helixes. Small versions (10 amino acids) fold into β-hairpin structures with di sulfide bonds. Large versions have repeats of proline like some vital proteins. As an example of their complex behavior one interaction occurs with JUN pathways, where it activates IL-2. But, JUN has 516 other reactions with genes and proteins that affect blood vessels, axon function and regeneration, and liver development. Therefore, the effect of cathelicidin is very large and varied. LL-37 has important effects on more than 16 different proteins with multiple receptors. These proteins operate in pathways with more than a thousand other molecules. 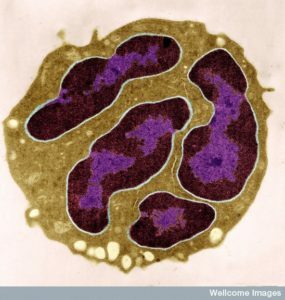 An example of the complexity is demonstrated when white blood cells (monocytes) are stimulated by LL-37. This stimulation triggers 900 genes in the blood cell. There are many other peptides that have similar effects regulating and modulating innate immune responses. LL-37 has more than 1000 interactions that occur by direct contact or secondary contact with the protein. These responses occur across many different immune and blood cells in different ways. HDPs, in fact, have vital roles in communication between all immune cells. LL-37 is also produced in immune cells. Most of the effects have been discovered in mice, who’s LL-37 is 60% similar to humans. Effects can cause or suppress inflammation in different circumstances and cell types. They can stimulate cytokines that attract particular blood cells to a region (chemokines) and can promote healing of wounds. They can stimulate new blood vessels through signals to capillaries. They can promote and suppress cell suicide in many immune cells including T cells and epithelial cells. They can stimulate blood cells travelling outside of blood vessels into tissues. They can help fight against pathological biofilms. Vitamin D3 was noted to be an important signal for protective T cells in a previous post. Vitamin D3 is also an important signal in producing LL-37. A treatment for TB uses D3 to stimulate LL-37, which decreases inflammation. LL-37 interacts with many other signals such as lipopolysaccharides and influences skin cells through pattern recognition receptors. LL-37 is unusual in that it can bind to receptors on the cell’s surface, but can also enter cells and stimulate receptors inside as part of pathways that trigger hundreds of genes at once. It influences some of the most well known and powerful cellular pathways including NF-κB inhibitor-α (IκBα), mitogen-activated protein kinases (MAPKs) p38, extracellular signal-regulated kinase 1 (ERK1; also known as MAPK3), MAPK1), JUN N-terminal kinase (JNK; also known as MAPK8) and phosphoinositide 3- kinase (PI3K). In addition to this large number of very complex pathways, it triggers more than ten transcription factors including NF-κB and CREB1. Such an enormous range of interactions makes it very difficult to predict which of many opposing effects it will have. In peripheral blood it stimulates many vital cytokines—IL-1B, IL-6, IL-10, IL-12-IL4 and others. Signaling for increased inflammation includes IL-17, IL-22. It is involved in stimulating more macrophages of the type that cause inflammation (M1). It can produce the inflammasome and many other effects related to activating inflammation. LL-37 also causes the movement of many cells including a variety of blood cells and skin cells. But, there are also a variety of anti-inflammatory effects as in other circumstances. These are also very complex with many different pathways in various cells, such as monocytes, B cells, T cells, producing IL-10. A vast array of functions in different cells has been discovered. LL-37 produces cytokines in neutrophils, monocytes, B cells, T cells, eosinophils, macrophages, platelets and mast cells. Multiple effects occur in epithelium of lungs, intestines and skin. LL-37 are antibiotics for biofilms, bacteria, viruses and fungi. They have anti cancer effects. There two classes of defensins, called α and β. There are six of the α type with different effects and pathways. 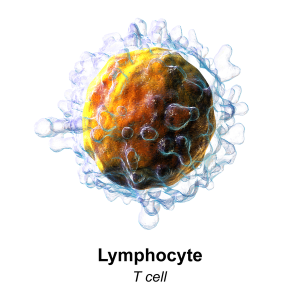 Many are produced by blood cells including lymphocytes, monocytes, and neutrophils. 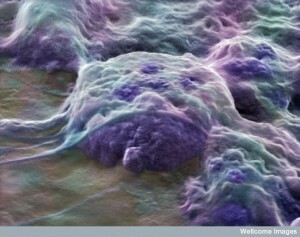 Many cells produce these including lung, gut, and reproductive tract in females. The second types are widely produced throughout the body. They are produced by many blood and immune cells and produce inflammation cytokines. Many epithelial cells produce them. Like LL-37, defensins can stimulate inflammation or fight against it based on circumstances and the cells and pathways involved. Defensins have high concentrations only in particular places—intestinal crypts and near neutrophils with granules. Neutrophils that are dying secrete these granules and can fight against inflammation locally. They block the effects of nitric oxide and other cytokines. They can influence blood cells to eat bacteria through multiple cytokines. They are vital in stimulating wound healing. Defensins are used to attract many kinds of cells such as neutrophils, monocytes, T cells, dendritic cells and mast cells. They use many different pattern recognition receptors and attract a wide range of cytokines. What is so confusing about them is that they have opposite effects in both inflammation and also cell suicide. They stimulate a very wide range of pathways in immunity and inflammation. Defensins affect Paneth cells in the intestine stimulating the attraction of other immune cells. Reproductive and lung epithelium produces defensins, when stimulated by intestinal epithelium. They produce movement of CD4 T cells. They are used as antimicrobials with bacteria and viruses. They simulate monocytes, macrophages and dendritic cells from T cell signals. They are involved in cancer suppression. They decrease HIV in oral epithelial cells. They stimulate more blood cells. Small variations can have very large differences in effects on pathways. These pathways are triggered by receptors on the cell membrane and internally. They trigger cascades that stimulate elaborate gene networks. Because it has been so difficult to find all actions of a small molecule, it has only now become possible to begin to piece together how they work in a language system. 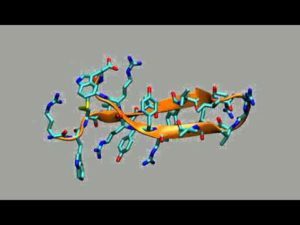 In fact, many of of the peptides work together in elaborate ways. New studies are able to look at the entire cellular gene activity at once and find patterns in the effects of HDPs. In monocytes LL-37 changed 475 genes at once that are part of many of well-known pathways already mentioned. The pathways are vital for insulin, cell adhesion, metabolism and much more. They also triggered 30 distinct transcription factors that alter gene activity in different ways. Another study showed effects of a particular HDP called HBD3 in macrophages. 5494 genes were activated at once. This was then studied using the database InnateDB. This public database has immune signaling pathways related to genes, and proteins in humans and other animals. It showed alterations in 30 vital pathways some up and some down. Cellular pathways were extremely varied from cytokines to metabolism of lipids. Patterns of interacting pathways were identified by finding proteins that are used in both. One analysis showed 900 genes in 22 pathways. Cytokine pathways were 30 genes that were suppressed and stimulated. One experiment used a synthesized version of an HDP that caused macrophages to have a unique state between M1 (inflammatory) and M2 (anti inflammatory). This altered 900 genes. What makes this even more complex is that immune cells can be influenced by many different HDPs at the same time. Since the effects of these peptides are just being identified, it is not clear how many are related to diseases. But, many might be the cause of important diseases. HDPs are known to be related to immune diseases. Cancer’s relation to HDPs is very complex. Mice without LL-37 have increased cancer growth. 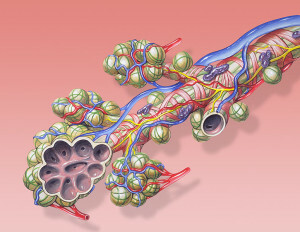 In pancreas cancer there are less defensins. One particular HPD1 suppressed oral cancer. These imply that HDPs prevent tumors and stimulate immune response. But, other studies show more complex interactions with HBD2 and HBD3 promoting oral cancer. In fact, these signals are related to many interconnected pathways that can have many different outcomes both causing and inhibiting cancers. Alpha-defensins can be increased in cancers. They stimulate cells to grow and they attract more blood cells, both necessary for cancers. They also signal against cell death, which helps cancers. LL-37 has interactions with killer cells that attack cancer. It also stimulates a greater amount of natural killer cells. Fragments of the molecule LL-37 are being studied as possible medications for cancers. Some appear to kill cells themselves. When LL-37 processes are not working properly, cancer is stimulated. LL-37 has been seen to stimulate pancreas cancer cells directly. Macrophages associated with cancers produce more LL-37, which seems to help the cancer. HDPs have a complex relation to lung diseases also. On the one hand, HDPs help the processes that clean lungs. These include ciliary movement of mucous, production of cytokines and stimulating blood cells that eat microbes. But, as with cancer, alterations in pathways related to HDPs can contribute to several major lung diseases such as asthma, cystic fibrosis, and chronic obstructive disease. Cystic fibrosis has a mutation that causes excessively thick mucous and many bacteria. While many HDPs are secreted in cystic fibrosis, they have less effect against microbes in this environment. Some modified HDPs are being tested as treatments. Some HDPs can help against lung biofilms. In chronic lung disease there are also a greater number of HDPs. While research continues, HDPs appear to be important in asthma, chronic lung disease and cystic fibrosis, but the mechanisms and effects are not clear. In diabetes, immune cells attack the pancreas and there is a decrease in LL-37 and other HDPs. Diet and microbes affect the levels of HDPs. The exact ways that HDPs are related to these diseases are not clear. They might contribute to problems with wound healing and prolonged infections in these patients. HDPs seem to contribute to rheumatoid arthritis and lupus as well, possibly by increasing inflammation through stimulation of particular cytokines. HDPs help defend invasion of microbes in the skin. Keratinocytes make many When skin has inflammation, many more LL-37s are produced. While they seem to be relevant to skin diseases such as atopic dermatitis, their roles are not clear. They also seem to stimulate progression of psoriasis. In the gut, large amounts are produced in crypts to ward off dangerous bacteria. Vitamin D3 stimulates large amounts of HDPs including LL-37. They seem to help wound healing. There are less in chronic ulcers compared with acute surgical wounds. HDPs were protective in a Parkinson’s study. Signaling among cells is the basis of all physiology. But, the number of unique and different signals is increasing exponentially. 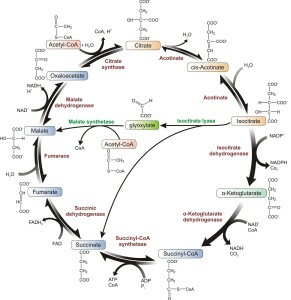 It is hard to imagine the number of possibilities in signaling with endlessly variable lipids, sugars and ubiquitin tags, as well as thousands of transcription factors, small RNAs, cytokines and neurotransmitters. 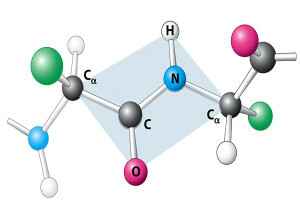 Now small strands of amino acids are a new language of signals, for which thousands are already known. Not only are there thousands of new signals, but also each signal can have interactions with many significant cascades and pathways in the cell. This makes it hard to predict variable effects. It is very hard to imaging how all of this signaling is directed. 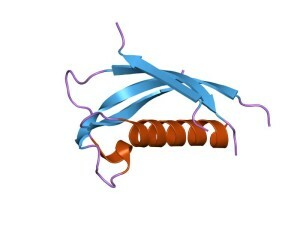 This entry was posted in Neuronal Plasticity, Cellular Intelligence, Microbes and tagged HDP or host defense peptides are important immune signals, Cathelicidin peptides affect many pathways, LL-37 can stimulate and suppress inflammation, Defensins can stimulate or inhibit inflammation, HDPs help and inhibit cancers. Bookmark the permalink. molecular mechanical theory via established links from microRNA flanking sequences to DNA base pair substitutions and amino acid substitutions in adhesion proteins. The adhesion proteins include heat shock proteins that link the epigenetic landscape to biophysically constrained nutrient-dependent RNA-mediated protein folding chemistry and cell type differentiation via the structure and function of supercoiled DNA. discoveries reviewed here link the nutrient-dependent microRNA/messenger RNA balance from metabolic networks to genetic networks and to healthy longevity or virus-driven pathology in the context of what is known about all model organisms. For God’s sake, learn something about biologically-based cause and effect. If you do not want to learn from Jon Lieff, why are you here? Why are you here when nothing you’ve had to say about linkage has been discussed in any of Jon Lieff’s articles, including that one. His virus trickery is explained with clarity. Your virus “links” that take us back to the big bang have never been explained by you or anyone else that you can cite. With respect to Kohl’s epigenetic energy dependence (see what appears to be some sort of chart below), we must be reminded of the struggle of Boltzmann with the proper description of the behavior of classical macroscopic bodies in equilibrium in terms of the properties of the particles out of which they consist will be sketched. He used both a dynamical and a statistical method. However, we must also remember that Einstein strongly disagreed with Boltzmann’s statistical method, arguing that a statistical description of a system should be based on the dynamics of the system. This opened the way, especially for complex systems, for other than Boltzmann statistics. The first non-Boltzmann statistics, not based on dynamics though, was proposed by Tsallis. A generalization of Tsallis’ statistics as a special case of a new class of superstatistics, based on Einstein’s criticism of Boltzmann, is discussed. It seems that perhaps a combination of dynamics and statistics is necessary to describe systems with complicated dynamics. The most important thing to remember is that people like Roy Niles are biologically uninformed and they refuse to inform themselves. Instead, they attack people who are well-informed and those who also have is history of publications on a topic of expertise, like molecular epigenetics. Then, they want others to learn from those who have remained biologically uninformed about dynamical and statistical methods that have done nothing to reveal the link from energy-dependent metabolic networks to genetic networks in all living genera. That’s why the biologically uninformed have not linked virus-driven energy theft to all pathology. That’s why the rabbinical form of debate that begins with “You fool…” is appropriate for use in refuting any of the ridiculous claims made by Roy Niles, or others like him. Its looking exponentially complex, we’re going to need better brains to understand this! Will we be able to understand it all I wonder, or will it be too complex? Kohl has just shown us how to handle complexity by linkage, which he has discovered to have causative effects. Details, schmeetails. won (but refused to accept) a Pulitzer Prize for publishing “Arrowsmith,” in the same year (1925) the Scopes trial in Dayton, TN led the way for neo-Darwinists to prevent all scientific progress, which could have been made by LINKING viruses from energy theft to all pathology. Ask Greg Bear what he has known for more than 30 years. Ask Jon Lieff. Please stop the nonsense. Ecological adaptation is energy-dependent and viruses steal the energy. That’s why dogs can be trained to sniff out cancer. They detect the difference in the pheromone-controlled physiology of energy-dependent reproduction in bacteria. Simply put, they can be trained to detect virus-driven energy theft. Ask these asinine questions to those such as James A. Shapiro, who is actually linked to adaptive mutation, which has superseded the modern synthesis and is an actual professor that Kohl has never talked to, and works at an actual university where Kohl has never been to. Dogs have been “trained to detect virus-driven energy theft”? You might as well say they’ve been trained to detect quantum time reversal, neither of which makes any scientific sense. Note that Kohl is still insisting by his capitalization that the word LINK not only implies but delineates a causative relationship between two things, and that’s a definite LINK to his intellectual weakness (and to his chicanery) where even if he were able to discern the difference, he couldn’t and wouldn’t do so, as his whole pheronominal house of perfumed cards would fall. Note that he continues to say “ask Jon Lieff” about the links that he continues to propose as causative, and further note that Jon Lieff has never written anything in any of these posts that supports this silliness in any way, and has never replied to any of Kohl’s entreaties or supported any of this nonsense in these articles. And Kohl has never pointed to any evidence that he has. Evidence of course is an element needed for an explanation, and Kohl has never presented explanatory evidence for anything – just a link to a link, ad infinitum – and even there the actual causative links, as well as any scientific or philosophical acumen at all, have regularly gone missing. Ask yourself why. your important information and will try to learn more about it. That’s is what he has done. What a joke. That post was three years ago, and that’s why you’ve never mentioned it before, only mentioning it now in desperation. And as to who’s a liar, it wasn’t an article that you wrote in any case. You cite two legitimate papers with scientifically explained experimental results, and even though you had nothing to do with them, pretend they have something to do with your litany of energetic links? Yes, energy causes everything, but how, when, where and especially why is beyond your ken. Which doesn’t stop you from pretending that the whys are automatically determined by the whats, which are automatically determined by the wheres, which were automatically selected by when they joined the chain – even though there’s no such thing as a linear chain of causative events in evolution. Although perhaps you will continue to think there is. Don’t try to tell anyone what I think. Roy Niles — without telling them I think you are a biologically uninformed antagonist who knows nothing about cell type differentiation and who refuses to learn. You, Kohl, have just cited an article about how adaptive mutation functions, and that’s a process that you’ve continuously claimed was ridiculous. In any case, as to my pointing out what you think, are you now denying that you think that way? And if so, can you be specific for a change, and tell us what it is that you deny and why? Mutations are not adaptive. They link virus-driven energy theft to all pathology. That’s one of the dumbest things you’ve ever said. Although it’s typical that your whole grasp of cause and effect makes no attempt to account for mutations that serve adaptive purposes. Showing again that you don’t even see your links as serving causative purposes – just connections that transfer energy and let it magically transform itself along the way. Viruses steal the energy that is required for cell type differentiation. That causes the accumulated mutations that are clearly linked to all pathology. There is no such thing as an adaptive mutation, no matter who reports their results in such ridiculous terms. All serious scientists know there must be an anti-entropic force that links the creation of energy as information and life-sustaining information. Some know how to link biophysically constrained protein folding chemistry to the physiology of reproduction. Many know there must be a way for supercoiled DNA to protect the organized genomes of all living genera from virus-driven entropy. If not, every person on Earth would exhibit the pathology that you exhibit in each of your comments about me. Please tell us again why you are so much smarter than those such as James A Shapiro, the expert in bacterial genetics. and professor in the Department of Biochemistry and Molecular Biology at the University of Chicago. He’s the one that brought adaptive mutation to life. And he actually does experiments that prove his points! And publishes peer reviewed papers!! To my knowledge, Shapiro has never linked energy-dependent hydrogen-atom transfer in DNA base pairs in solution from microRNA flanking sequences to biophysically constrained RNA-mediated DNA repair. DNA repair, as all serious scientists know, ensures the physiology of reproduction is linked from the innate immune system to supercoiled DNA. The supercoiled DNA protects the organized genomes of all living genera from virus-driven energy theft and genomic entropy. That may be why he does not know that mutations are not adaptive. The accumulation of viruses links energy theft to mutations and all pathology. Please tell him that, if you think he does not already know it. He may just be joking about the adaptive mutations, and that would mean the joke’s on you, or that you are the evil joker, Roy Niles. He’ll simply wonder what evil virus linked the theft of intelligent energy from your brain to smelliness..
Tell him to search pubmed for “Loss of function mutation” and microRNA as an indicator of your pathology. He laughed so hard when I linked your name to science that my ears hurt. I did not say anything about linking my name or my model to virus-driven energy theft and energy-dependent microRNAs linked to healthy longevity or from viruses to pathology. Only a fool would laugh about this established link to cancer. You missed the point s usual, Kohl, which is that you’re not recognized as a scientist at all by legitimate scientists, and in addition, you use reviews like the one you just cited to try to steal your mockery of science from, and in the attempt, you get all of the sequential systems of the process wrong. And worse, you come up with ridiculous phrases like virus driven energy theft, which is a meaningless conception that you invented, and that you haven’t even made a proper lie up to explain. In fact, “explain” does not seem to be in your vocabulary. Only a fool or a quack would try to establish a link to cancer without explaining it. Once again you are lying and telling others I have not established a link from virus-driven energy theft to all pathology. molecular mechanical theory via established links from microRNA flanking sequences to DNA base pair substitutions and amino acid substitutions in adhesion proteins. The adhesion proteins include heat shock proteins that link the epigenetic landscape to biophysically constrained nutrient-dependent RNA-mediated protein folding chemistry and cell type differentiation via the structure and function of supercoiled DNA. Einstein’s theory fits into the context of Darwin’s “conditions of life” via the de novo creation of nucleic acids; the nutrient-dependent function of the ribosome; and the de novo creation of olfactory receptor genes. De novo gene creation is the “holy grail” of biophysically constrained chemistry and biologically-based cause and effect. The discoveries reviewed here link the nutrient-dependent microRNA/messenger RNA balance from metabolic networks to genetic networks and to healthy longevity or virus-driven pathology in the context of what is known about all model organisms. A randomly assempled proclamation is neither an explanation nor an establishment. You already know about my history of published works, Roy Niles. And most people who follow my post on Disqus know what you are. Kohl, Do you mean your history of published reviews based on how links unexplainably operate to construct other links without a known purpose or a known cause? Yes, I know about them. As to the people who allegedly follow you on Disqus, the fact that none of them have come to your defense on these forums, means it’s also possible that they know what YOU are, and that you’re indefensible. Thanks Roy Niles. I just learned yesterday that some people don’t understand my claims about “virus-driven energy theft” because the phrase does not come up in a Google search. I am attempting to remedy that problem. You’ll have to remedy your entire “theory” to fix that Google problem. You will need to get professional psychiatric help. On both of those sites you’re still repeatedly quoting yourself to show evidence of previous proclamatory “explanations” of your cockamamie theories. How psychotic is that!! Almost exactly the same thing you’ve done on YouTube by meaninglessly commenting several times in a row about yourself. If anyone else decides to tell the truth about what is known, and details it in the context of what is known about virus-driven energy theft and all pathology, I will cite them. Until then, I will continue to integrate what is currently known and you will continue to deny that I have been doing that for 20 years. It’s what biologically uninformed antagonists do before they disappear after the facts become known to everyone. Yep, Yahoo is the place to search for self promoting yahooism.